The tomato-based drinks typically pack a spicy kick, a flavor profile that’s growing in popularity with consumers. They’re well-suited to differentiation and customization through a wide variety of garnishes, flavorings and mix-ins. Bloodys are easy to prep with premade mixers and pre-assembled garnishes. The cocktail is well-matched to the burgeoning social occasion that is brunch. And, especially when they’re served with an array of interesting garnishes, Bloody Marys are more than ready for their Instagram close-ups. Bloody Mary menu mentions have jumped 16.4% in the last five years, according to Technomic. And overall menu penetration of the drinks rose from 23.8% in the third quarter of 2011 to 27.3% in the same period this year. The cocktails are ripe for customization. Menu a range of spice levels, like they do at Tweet in Chicago. The popular brunch destination offers Bloody Marys spanning Classic to Wasabi to Sriracha-laden Smokin’ Hot. Spice levels can be controlled both by ingredients added to the drink and different chilies, spiked salts and other seasonings used to rim the glasses. Another perk? It’s easy to simply omit the alcohol and cater to the mocktail crowd. Personalize the Bloody Mary to your operation. The Another Broken Egg Cafe chain offers an Another Broken Maria cocktail with Agave Loco and Lunazul Blanco tequilas instead of the traditional vodka. Biaggi’s Ristorante Italiano serves an Italian twist on the drink, garnishing it with an antipasti skewer. Go wild with garnishes. Trending choices, according to Technomic, include bacon, shrimp, crab and pepperoni. Bloody Marys make the perfect canvas in which to showcase the efforts of in-house pickling programs, as well as a great way to call out local produce. 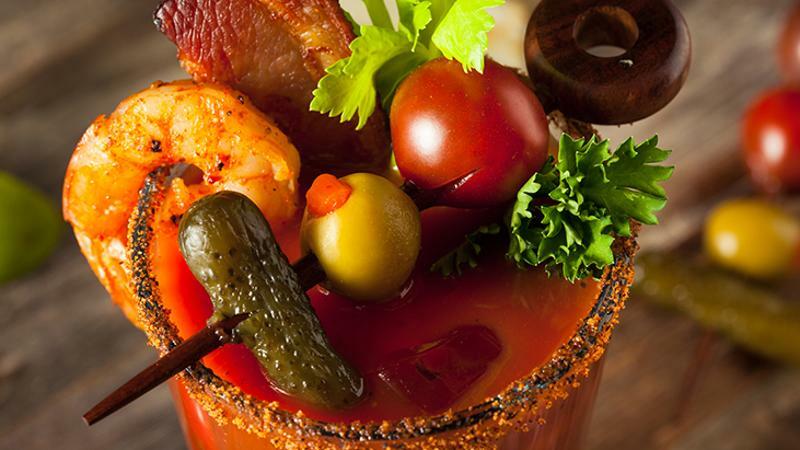 Cleveland’s Market restaurant rolls its Bloody Mary cart in for Sunday brunch. The cart features three dozen locally sourced offerings, ranging from tomatoes, pickles and peppers to assorted meats. A housemade pepperoncini stuffed with sour cream, bacon and chives is the restaurant’s signature garnish. The cart builds enthusiasm in the dining room, and the restaurant typically sells hundreds of the cocktails each service.